Is this statment also true for using "/crx-quickstart/repository/install folder"? Is it possible or better to use quickstart/repository/install folder on every single instance? -- Possible. But no need. Thanks Yogesh for your fast feedback. >> We use the journal mechanism for synchronising two independant fallback cluster. So I think of something like a shared install folder copying a file into it, and all instance will be restarted. Have you tested all this in CQ 5.5. It seems that the repository/install directory was removed in this version. Sorry for inconvenience, I think for CQ5.5 putting those file directly under /crx-quickstart/install folder should work. Can you please try it and let me know. Yes it should be same process. Let me know if it does not work. It is the same folder as in 5.5: crx-quickstart/install folder. I have tried the steps to install the packages with quickstart jar based on this article: http://helpx.adobe.com/crx/kb/HowToInstallPackagesUsingRepositoryInstall.html. And I see that my custom packages are getting installed way before all other AEM product packages. Is that fine or is there a way for me to configure so that my custom packages get installed after AEM product packages? Can you try renaming your package and give name that start with "Z" or something and see if that changes any thing ? I think that's not an issue because my package names are : cq-5.6.0-hotfix-2893-2.zip a d hcs-1.0.0.zip and they got installed in between the 5.6 packages - com.adobe.granite.platform.users-1.0.0.zip and com.adobe.granite.monitoring.content-1.0.10.zip. If it was based on the naming, hcs-1.0.0.zip should have installed after these two AEM packages. Thats possible that Auto installer give file system preference over repository. I see that file system installer has start level 1 and content package installer has start lever greater than 1.
ok. Is there any way I can change those settings to get to the right behavior? Really appreciate your help! Also, if I delete the package in install folder, it's not uninstalling and deleting the package. Is that expected behavior? I think in order to ensure that your hotfix/feature pack installs only after all the default packages of 5.6.1 are finished installing then you will have to have a dependency of cq-content-5.6.1.xxxxx in your hotfix pom. So that the installation of hotfix starts only after all the packages of 5.6.1 are installed. Folder does not exist by default. Please create one. great Yogesh.Thanks for your support. If i need to install package of 14 Gb size. Is it possible to install through /install location? If yes, how much time approximately to finish installation ? 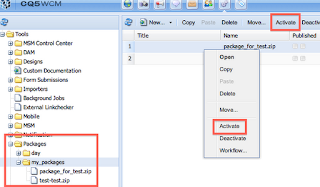 I created install folder under crx-quickstart location. Placed a package 10 MB named as z.zip. home/cqauth/aem5.6.1/crx-quickstrt/launchpad/startup/1/ ---> i can see soome Jar files are located here. Please let me know is this location i can add and try running some zip packages.? 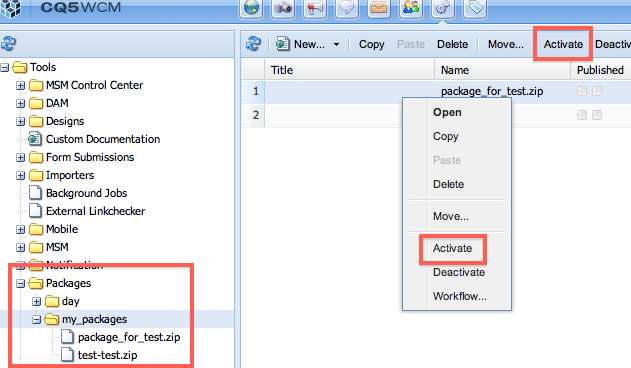 Make sure that package that you keep under install folder is valid package. Please do not do any thing with /crx-quickstrt/launchpad/startup/1/ these are launchpad specific bundles. Are you able to install your bundle using package manager ? As mentioned above multiple install work for Bundles as well. Consider a case where I have 2 version of bundles and both are active. How my jsp will recognize which bundle to refer ? If you have 2 bundle with same artifactID/groupId then bundle with highest version number will take precedence over lower one and only that one get installed. I have a package that has already been uploaded on package manager. Also I have uploaded into install folder as well. Now I need to install this package during every instance restart. Please let me know the steps.